DUPORTH (AUS) (Bay or Brown 2005-Stud 2010). 3 wins to 1400m, BTC Cup, Gr.1. Sire of 158 rnrs, 93 wnrs, inc. SW Hey Doc (MVRC Bill Stutt S., Gr.2), Dashing Fellow, Ruettiger, SP Cornrow, Inkling, Two Over One - Wingold (H.K.) and of Dee Nine Elle, Paceman - Sunny Dragon (H.K. ), Axanite - Racing Supernova (H.K. ), Dupe 'em, Mooshakissa, Notio, Private Lounge, Balmain Boy, Eminent Knight - What Else But You (H.K. ), Endless Don, Braces, etc. TEA TIME, by Exceed and Excel. 2 wins at 1100m, 1200m in Aust. This is her first foal. Te Rux - Felizmaster (Mac.). 6 wins to 1400m to 2016-17 in Aust. and Macau, Macau Jockeys Challenge Bowl. Torino. 2 wins at 1100m, 1200m, 3d STC Sydney Markets Limited H.
Tea Time. 2 wins. See above. Soviet Union. Winner at 2 in Aust. RUSSIAN CARAVAN (Dehere). 5 wins. See above. SERENE MAJESTY (Fastnet Rock). 3 wins to 1400m, A$458,000, in 2015-16, MRC Thoroughbred Club S., Gr.3, Scone RC Inglis 3YO Guineas, L, ATC Tab.com.au P., 2d ATC TAB Rewards 2YO H., 3d Hawkesbury Guineas, Gr.3, ATC South Pacific Classic, L, MVRC William Crockett S., L, 4th MRC Ladies Day Vase, Gr.3. Brulee (Hinchinbrook). 2 wins-1 at 2-at 1000m, A$82,260, to 2016-17, 2d Qld Tatt's RC Wintergarden S., L, ATC Piper-Heidsieck 2YO H., 4th VRC Lexus Hybrid P., L.
Thirio. 6 wins from 1400m to 2200m, A$87,550, STC Dooleys H., AJC Hurstville H., STC Stacks the Law Firm H.
Gunpowder. 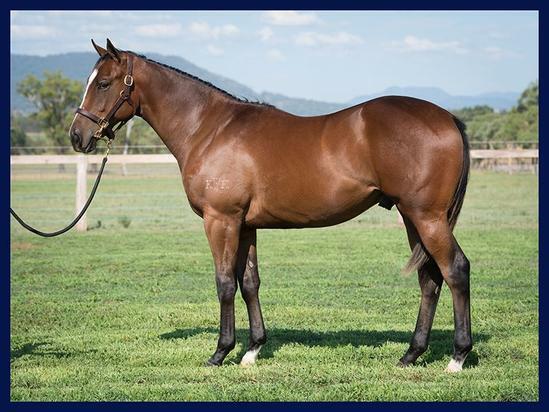 3 wins-1 at 2-to 1100m, MVRC Cleanaway H. Sire. FRAVASHI (Falbrav). 5 wins-3 at 2-at 1200m, 1400m, £6,094, A$529,050, 763,600Dhs, MRC D'Urban S., Gr.2, QTC Sires' Produce S., Gr.2, AJC South Pacific Classic, Gr.3, STC Ruby's Freeway 2YO H., Hawkesbury RC Windsor RSL 2YO H., 2d Meydan Al Quoz Sprint S., Gr.3, MRC Zeditave S., L, 3d QTC TJ Smith Classic, Gr.1, York City of York S., L, 4th MRC Wellington Racing Club S., L.
Alegria (Medaglia d'Oro). 3 wins to 1500m, A$312,425, ATC Perfection Landscapes Walk 4 Nathan P., Schweppes H., Ladbrokes.com.au H., 2d ATC Chairman's H., Gr.2, Gifts.com.au H., 3d ATC Aspiration H., Gr.3, Colin Stephen H., Gr.3, City Tattersalls Club Cup, L, ATC Bill Gilmour Tennis Centre P., TAB Rewards H., Sportsyear Diary H., TAB More Than Winning H., 4th ATC Epona S., Gr.3. Serene Look (Seattle Dancer). 3 wins. See above. COSTA VIVA (Encosta de Lago). New Zealand Bloodstock Filly of the Year in 2013-14. 3 wins from 1200m to 1600m, NZ$266,685, A$5,000, New Zealand One Thousand Guineas, Gr.1, Ashburton RC Ray Coupland S., L, 2d ARC Eight Carat Classic, Gr.2, Hawkes Bay Gold Trail S., Gr.3, Te Aroha JC Team Wealleans H., 3d WRC Desert Gold S., Gr.3, 4th Gold Coast Guineas, Gr.3, Hawkes Bay City of Napier Sprint H., L.
AUDACIOUS SPIRIT (Bel Esprit). 6 wins at 1200m, 1350m, A$382,200, BRC Lough Neagh S., L, 2d ATC Royal Sovereign S., Gr.2. HIGH AWARD - MR AWARD (H.K.) (Holy Roman Emperor). 8 wins-2 at 2-at 1000m, 1200m, £17,031, €20,888, HK$3,099,625 in GB, Ireland and HK, Epsom Woodcote S., L, Curragh Tally Ho Stud 2YO S.
MISTER MONET (Peintre Celebre). 5 wins-1 at 2-from 1400m to 2100m, Deauville Prix Guillaume d'Ornano, Gr.2, Haydock Rose of Lancaster S., Gr.3, Ascot Solitare Diamond H., 2d Newmarket Venture Lifestyle Photography H., 3d York Leonard Sainer 2YO S.Died at 3. THE LAST LION (Choisir). 4 wins at 2, £230,727, in 2016, Newmarket Middle Park S., Gr.1, Kempton Sirenia S., Gr.3, Sandown Dragon S., L, Doncaster Brocklesby 2YO S., 2d Doncaster Flying Childers S., Gr.2, Royal Ascot Norfolk S., Gr.2, Goodwood Molecomb S., Gr.3, Ascot Sodexo 2YO S., 3d York Gimcrack S., Gr.2. RUSSIAN ROCK (Rock of Gibraltar). 11 wins-1 at 2-at 1000m, 1200m in GB and U.A.E, Jebel Ali Sprint S., L-twice, Newmarket 32Red Casino H.
CONTEST (Danehill Dancer). 5 wins at 1000m, 1200m, £10,571, €126,448, 58,880Dhs, Cork S., L, 2d Deauville Prix de Meautry, Gr.3.